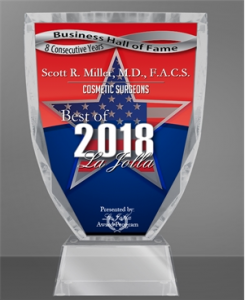 We are excited to announce that Dr. Miller has been recognized with the 2018 “Best of La Jolla” award in the category of Cosmetic Surgery by the La Jolla Award Program! This achievement identifies those in the La Jolla community who have demonstrated excellence in the services they offer, as well as fair and reputable businesses practices. Winners of the award are considered to have uplifted the city of La Jolla through their contributions to the community and dedication to their craft. As a result of this distinction, Dr. Miller has qualified for the La Jolla Business Hall of Fame. Dr. Miller is among a small handful of recipients who have won the “Best of La Jolla” award for eight consecutive years. Our practice has always sought to extend cosmetic enhancement of the highest quality and we believe this award speaks volumes about our ability to achieve first-rate results while creating a pleasant and comfortable treatment experience for everyone who walks through our door. Dr. Miller and our entire team would like to thank our patients for entrusting us with the responsibility of making their aesthetic goals a reality. To learn more about our San Diego plastic surgeon, or to schedule a consultation for possible treatment, please contact our practice today.